For the past several years, hubs and I have tried to solve a puzzle: What started World War I? I know, I know, Archduke Ferdinand was assassinated and then…stuff happened. But, what precisely was the “stuff” and in what order? It wasn’t as if the archduke was felled and the whole of Europe ran to grab their rifles from the attic like some Keystone Kops crowd swarming the scene. What we’ve been trying to pin down are all the intervening steps from royal assassination to worldwide conflict. We know the assassination was the first domino to fall. What were the others? So we’ve been reading books and even watched a rather grim documentary series on the subject of the war that we rented from Netflix. Still, our view is murky. Which is probably because the whole business was murky. People are still writing books about it, after all. When we were in Kansas this past June, we took the time to go visit the National World War I Museum in Kansas City, MO. If you are ever in that neck of the woods, do not hesitate, go visit this museum. It was one of the best museums I’ve ever been in, and I’ve been in most of the Smithsonians in DC. A Kansas friend of mine recommended it, and I’m very grateful. What makes this museum so great is that whoever put it together seemed to understand how to keep you interested and how to actually provide information. I tend to be a gobble-it-all-up excited museum-goer. I want to just race through them, looking at this, grabbing that view and then decompressing before I re-view exhibits. Maybe I have an attention deficit problem. I dunno. Those were diagnosed after I was a young’un. 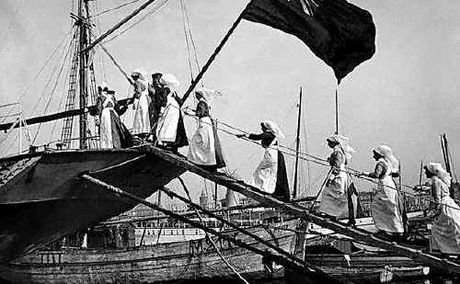 Nurses boarding a British ship during World War I. The World War I Museum allows you to sample or to amble. You can look and read and move on. You can linger. Either way, you’re going to get the picture. 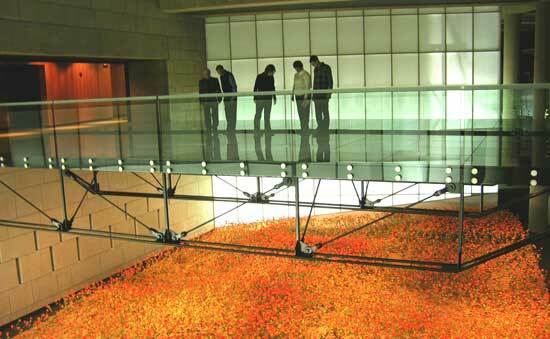 The whole experience starts when you walk over a transparent “bridge,” below which is a field of bright red poppies, into the dimmer cavelike structure of the museum. It’s as if you’re walking into a bunker, a trench. Wall displays give you a timeline–at last, the falling dominoes are made clear–for each year of the war. But at the bottom of each dreary list of battle bullet points there are other facts–things that were going on outside the war, video clips of Chaplin films, other notable events. This gives you context as you nod your head to events you’re familiar with, now seeing them happening against the backdrop of the war. Listening booths let you sample songs and poetry of the era. Listening to Wilfred Owen’s “Dulce et decorum est” after seeing the various exhibits is a sobering experience. But, speaking of poetry and the written arts in general, World War I supplies inspiration for many a story. Pat Barker’s trilogy is set during this time. Regeneration, from that trilogy, is a haunting tale that includes the ill-fated Owen as a character. The popular television series Downton Abbey included a season in which the war played a pivotal role. And recently Ford Madox Ford’s Parade’s End was dramatized on film. In commercial fiction, the aftermath of the Great War is captured in the popular Maisie Dobbs mystery series, written by Jacqueline Winspear. Maisie is a private detective and adroit in psychological arts. She is deeply affected by the war, having served as a nurse to the wounded and losing her beloved to shell-shock. For those who are fans of this series, let me make a recommendation: the biography of Vera Brittain, Testament of Youth. Brittain is very similar to Maisie (so much so that some astute mystery readers wonder if Brittain is Winspear’s inspiration). As a girl, she yearns to know things, to learn. She goes to university and becomes a nurse when the conflict starts. She has a beloved, too, who meets a sad end. And even though you know his fate when you begin the book, it cuts you to the core when you learn of his battlefield death through Brittain’s words. She suffers other losses, too, and by the tale’s end, you’ve experienced with her the complete devastation of this war to end all wars. She became a pacifist and did find another love, whom she married. But World War I left deep scars that never really healed. Armistice Day will soon be upon us. On the “eleventh hour of the eleventh day of the eleventh month” in 1918, the “war to end all wars” ended. Alas, as we all now know, it wasn’t really the end, but merely a tamping down of embers that would burst into flame a little more than 20 years later. I watch soap operas, okay? I admit it. Well, I actually only watch one–Days of Our Lives. Back in the day, I also used to watch Another World. That’s Deidre Hall back in the day with her on-air love. 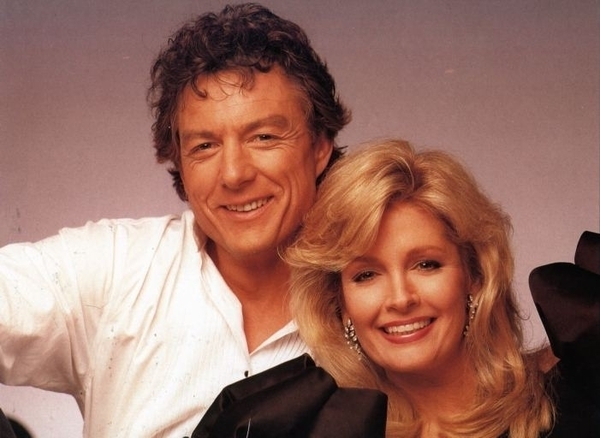 Back to our story...Days of Our Lives, like many soaps, or the few that are left, has some characters who’ve been with the show since it sputtered to life. Deidre Hall is one of these actors. She plays Marlena Evans Craig Brady Black, the resilient, much-loved, much-afflicted and actually bedeviled (yes, she was at the heart of an exorcism story at one point, a dazzling piece of storytelling that took one’s breath away, and yes, I’m serious) mother of Sami and Eric Brady, Belle Black, and stepmother to Carrie Brady and Brady Black. 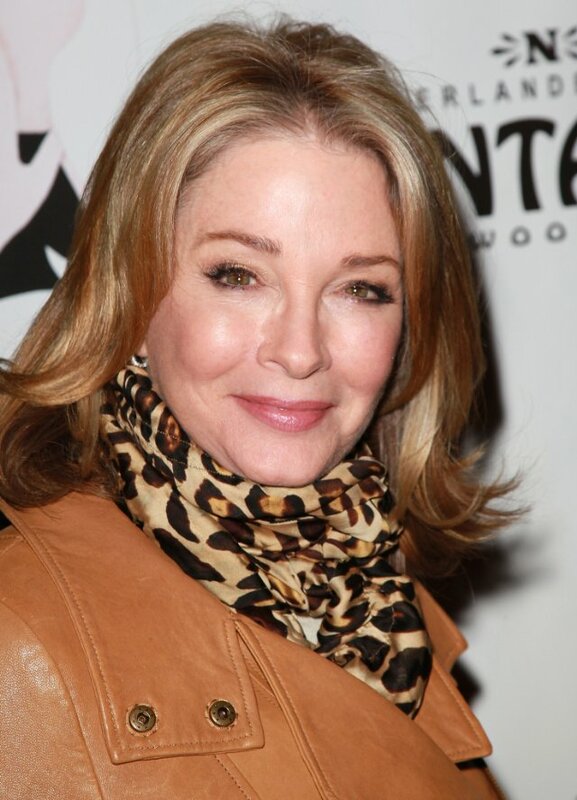 Deidre Hall, like many leading actresses, is beautiful. Blond hair, fair features, gorgeous skin and figure. The same is true of another soap heroine: the Young and the Restless’s Nicole “Nikki” Reed Foster Bancroft DiSalvo Landers Chow Sharpe Abbott Newman played by Melody Thomas Scott. I don’t follow the Young and the Restless, but I occasionally flip to it during commercials of Days. I hadn’t done so in a long time, so you can imagine my shock, my absolute horror, when I flipped over to Y &R and noticed that Nikki had…aged! I flipped back to Days and couldn’t ignore the truth–Deidre Hall has also aged! It was like looking in a mirror and seeing what time hath wrought! If they’re getting older, then–egads–so am I! Let me expand on this. It’s not that I think of myself as a spry, young thing anymore. I’m a Woman of a Certain Age. I like who I am. I’m (reasonably) comfortable with what I look like, even if I could stand to lose a little weight and exercise more. And there’s the rub. I keep telling myself that with a little more work, a little less-fattening diet, I can do it, I can be fresh-faced and firm-toned. I just need to get around to it. And I will, oh, yes, I will. You can count on it. I will get around to it some time…tomorrow. But seeing these beauties show their years means it’s simply not possible to get around this aging thing. Forget the toning, the dieting, the botoxing. The Ravages of Time will find you faster than Vincent Price in a B horror movie. Before you get the wrong idea, let me point out that Ms. Hall and Ms. Scott are still stunningly beautiful. They are really lovely to look at. They’ve been blessed with great features, and they’ve taken care of themselves. When I say they’ve aged, I merely mean that they look a bit older. They probably look a good ten or more years younger than their actual ages, but they still look older than the new young ingenues on their shows. And they have grandchildren now. Or rather, their characters do. (I have a grandchild, too). But there’s no denying that taut facial features are a little softer now, and that high-necked blouses and scarves might be more about camouflage than fashion. I hope these ladies don’t have to struggle too hard to maintain their luminescent looks. When I see some of the anorexic gals in younger roles on their shows, I despair for the more senior cast members. Unfair, young nymphs! It’s easy to be skinny when you’re just twentysomething. You could stand to put on a pound or two. Melody Thomas Scott in her yute. My advice for the Actresses of a Certain Age: start leaving cinnamon buns and chocolate cake in those younger gals’ dressing rooms. Swap out the Splenda for real sugar at the coffee bar, the two-percent milk for heavy cream. Plump them up, while you breathe easy. You’ve served well. Do not go gently into that good night. Libby Sternberg is a novelist. Buy her books so she can eat (low-fat) chocolate cake and cinnamon buns. 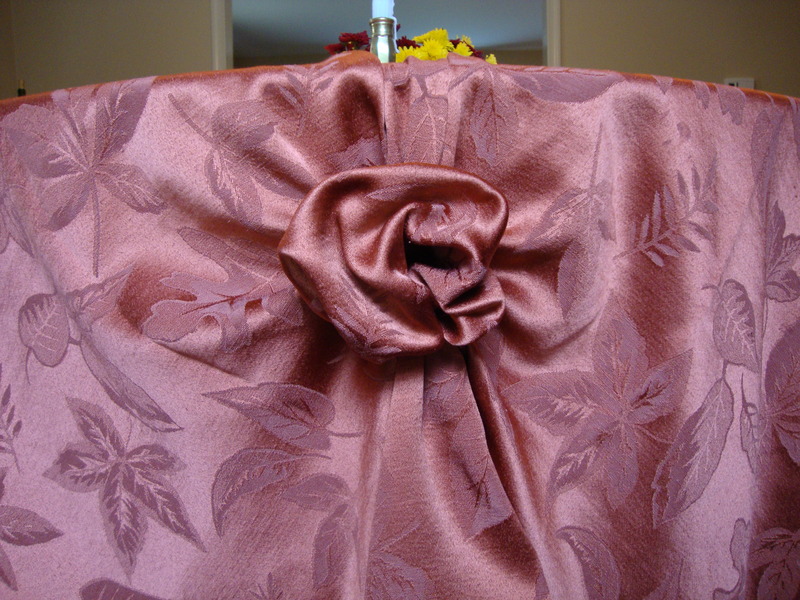 Shortening too-long tablecloths: I have a couple tablecloths that are a tad large. My tables shrank. Or maybe I kind of bought the wrong size. They’re okay when we have the leaf in the dining room table (just barely), but not so much when the table is its smaller size. I saw a caterer do this trick, though, and have tried it myself: gather a bunch of the tablecloth where it’s too long. Slip a rubber band around the “bunch” to create a rosette effect. See picture. This is great if you’re worried about guests tripping over the ends of a too-long tablecloth during a buffet serving. Grab a stool from the bar: Shopping at JC Penney with a friend and don’t have anywhere to sit while they’re in the fitting room? Grab a stool from one of their silly “jeans bars” and park yourself on it. You’ll probably be doing them a service. As readers know, I was no fan of the recently fired Penney CEO Ron Johnson. One of his “innovations” was to create these “jeans bars” within the stores with tables full of jeans and stools pulled up to them. (For what? The mind boggles.) Anyway, if we can get an army of folks moving these stools to places in the stores where people really do want to sit…it’s a corporal work of mercy, I tell ya! Scrambled eggs: Listen to Ina–Garten, that is. Slow and low. She advises not cooking them too quickly, and I have to say this does result in a softer scramble. I also read somewhere that adding a little seltzer water to the mix can make them fluffier, but I haven’t tried that. Put nutmeg in your pancakes: I’ve been doing this for years, ever since I figured out why a particular eatery’s pancakes tasted so yummy. Just add a sprinkle or two to your batter. Dress your onions first: I like onions in salad, but I don’t like that raw onion taste that lingers. So, I slice onions very thinly, place them in the salad bowl and dress with vinaigrette first. They hang out while I make the rest of the dinner, then I throw the greens and other veggies in and toss right before serving. Take your shoes off: You have a gorgeous pair of shoes, but they get a tad uncomfortable after a while. You wear them to a wedding or other gathering. The floor might be dirty but it’s not strewn with broken glass, so…just take your shoes off and dance. At a recent wedding, I was delighted to see many guests dancing barefoot (or in their stocking feet). I walked around after my beautiful, but rarely worn, silver shoes started to make my feetsies ache. Amazingly, no one commented on this. Sparkle: I’m a big proponent of sparkly jewelry, sparkly apparel and sparkly…personalities. When I was younger, I favored chiffony clothes and sparkly jewelry, but then the sixties came along and ruined everything with their bell-bottom jeans uniform. Nowadays, however, I wear sparkly jewelry even with jeans. I have learned not to save nice things for so-called special occasions. Every day is special. Libby Sternberg is a novelist. Buy her books so she can buy more shoes and sparkly things. It’s breast cancer awareness month (although I have to say that it’s hard to imagine folks who aren’t aware of this disease by now). The campaigns to raise awareness have been pretty successful. What might still be a challenge, however, is getting women to actually get tested for breast cancer. I speak from experience. I found it extremely difficult to schedule a mammogram for a very simple reason: fear. My mother had died of the disease. My sister is a breast cancer survivor. Many other women in my family have faced it, too. I was in the ignorance-is-bliss category. In fact, while I think of it, a good campaign might include a lot of those “all clear” voices offering reassurances to women, with the underlying message being, however, that for the minority who don’t get the positive mammo outcome, a positive future can still await. Anyway, for me, part of the “it” I feared was losing my hair if I had to face the Big C and its treatment. I had a real problem with that. Until I got two wigs. I loved them so much I took one to a hairdresser and asked her to cut my hair in that style after it grew back. If you’re afraid of the test, however, let me offer some advice: Find a good breast health center and have your mammogram done there. The center I go to seems to do everything possible to take the stress out of the event. The decor is soothing; background music calming; staff helpful and solicitous. They seem to go out of their way to minimize the wait, and you need not wait in a public room but can read quietly and deal with your fears alone, if that’s your style, in single small dressing rooms. This particular center also assigned a nurse to me once the diagnosis came in. She provided me immediately with a helpful booklet and acted as my “shepherd” through the process. I was shocked–and delighted–when she showed up for my first visit with my oncologist. When I had questions about direction, I often turned to her first; then she helped me figure out how to approach my doctors. Being captain of your ship, by the way, means choosing the right doctor’s practice for you. Notice I use the word “practice.” You might find a terrific oncologist, but if the staff seems surly, do you need that stress? When you’re in distress, you don’t want a curmudgeon as the gatekeeper to the doc. Being the captain of my own ship also meant thinking of ways to ease my tension. Anyone who’s faced breast cancer knows that any lump raises concerns. But after surgery, some lumpiness can be….nothing. To reassure myself, I cut out a piece of a dress pattern in the shape of one particular hard spot and used it to judge if there were changes occurring. My oncologist was impressed. And being captain of my ship sometimes has meant saying no to procedures I don’t want. Every year my doc would ask me to get a bone density scan to check for osteoporosis because one of the meds I’m on can apparently lead to bone weakness. But I am not interested in taking any meds to correct that condition, should I have it (and there’s no evidence I do), so why bother with the test? At one recent visit, the office nurse asked me if I’d gotten the test. I said no and explained why. She smiled and said: Good for you. More advice: subscribe to a magazine called Cure Today if you or a loved one faces a cancer diagnosis. Of all the waiting room reading material, this magazine stood out. It’s upbeat without being sappy. It’s intelligent and speaks of research and treatments, while also covering the psycho-social aspects of this disease. It was in this magazine that I read of the fearsome “cast off” feeling after treatment ends. After being seen by medical professionals virtually every week, suddenly you’re told: see you in a year. Feeling apprehensive then is normal. Good to know. Don’t say “My mother/sister/friend died of that” upon hearing of someone’s diagnosis. Do tell a cancer patient about survivors you know. Do think of thoughtful, helpful things to do to help a patient through that treatment regimen. My sister-in-law visited during one session and cleaned and cooked with no instruction. My sister sent me a gift package with magazines to read during chemo and other fun things. My kids sent flowers on my first day of chemo. And an aunt sent me one of those breast cancer pink items that companies manufacture, using part of the proceeds for research or awareness. 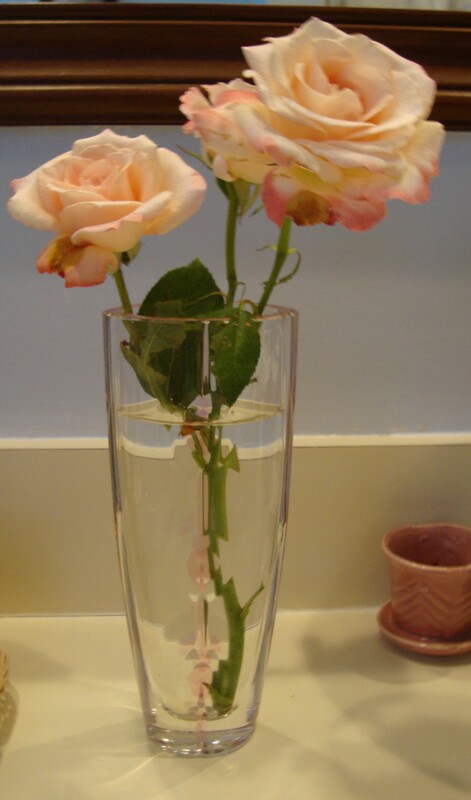 It’s so lovely I include a picture here–a Lennox vase with a faint pink pattern. I use it often. It’s a reminder of family, love, hope and beauty. And that’s what this month should be about, too.